Pilots wishing to cross over from Paragliding (PG) to Powered Paragliding (PPG) or PPG to PG can now enroll in a special clinic designed just for this purpose. Broaden your horizons today and enjoy more airtime by expanding your knowledge and flying skills in our unique aircraft! The biggest advantage to crossing over is increasing your ability to fly more often, at more times during the day, and at more locations. While there are many similarities, there are some different and specific techniques and skills to learn that will make each discipline safer and more fun. To enroll in this class, pilots must be proficient in either PG or PPG. Additional instruction may be necessary to earn certification for either sport. Read our article about Crossing Over, which appeared in Paraglider Magazine. Our school is uniquely qualified to teach crossing over, as we actively fly both ways on a daily basis. We have specific study materials for each type of flying to help you understand both the similarities and the differences. 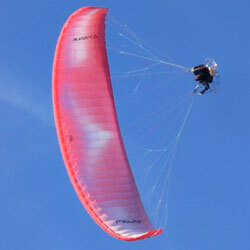 Free flight pilots wanting to fly with a paramotor will learn about their particular motor unit, setup, preflight, launch techniques, flying considerations, landing, safety, airspace limitations, motor care and transport. Clinic will include flight simulator work to allow the pilot to feel the sensations and develop responses appropriate for powered flight. If the pilot has met the requirements for certification, the USPPA PPG1 and PPG2 tests can be administered. Proficient PG pilots will usually take 2 days to complete the Crossing Over Clinic. Skill permitting, the final day of this clinic will include the pilot's first solo powered flights. Students must have their own equipment or purchase the gear from us, or there is an extra charge for using our motor for training. 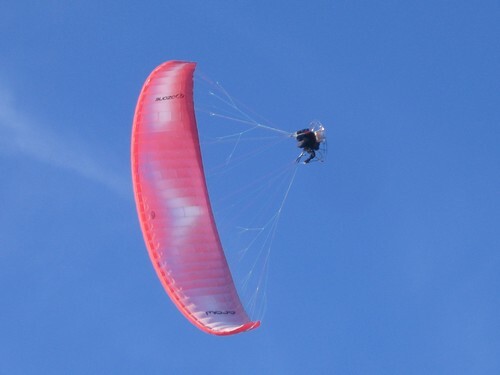 We will cover Setup and Preflight, launching techniques, flying skills such as seat-steering or weight-shift, landing zone proximity, approach and landing, advanced kiting techniques and appropriate weather observations. Class includes simulator work to better understand correct flying posture and brake toggle inputs appropriate for non-powered free flight. If the pilot has met the requirements for certification, the USHGA P1 and P2 tests may be administered. It will typically take 2 days for proficient PPG pilots to complete the Crossing Over Clinic. This clinic includes many solo flights to master and demonstrate solo flying skills to the instructor. 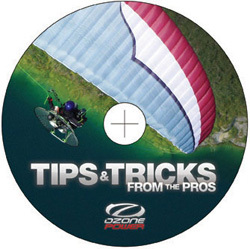 This DVD is perfect for Paraglider pilots considering crossing over to Paramotoring! and can demonstrate this knowledge when speaking with the instructor and when taking the written exams. If you feel you need more instruction in these topics, minimally purchase and read a copy of Paragliding: A Training Manual or The PPG Bible. Better yet, arrange for ground school classes with one of our instructors. 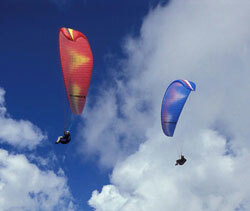 To learn more about Paramotoring and Powered Paragliding, see our American Paragliding website. For more information about soaring free flight without power, visit Fly Above All. If you have specific questions, please feel free to contact us by phone at 805-966-5900 or email us at the address on the left. Blue Skies!